I predict a roller coaster year for the markets but remember, you are planting seeds for later and roller coasters create opportunities. In fact, my purchases, as you will see, were all from opportunities. I shared investment lessons I have learned and a new one is that within the first year of purchasing a stock, there will be a 50% chance you are up or down. Remember the following quote, it’s critical to manage your emotions about your portfolio and the journey to financial independance. In the short run, the market is a voting machine but in the long run, it is a weighing machine. If you are retired or near retirement, I would expect you have a ladder strategy for accessing cash over a 3 year rolling window to avoid being hit by a market swing. Since we entered 2019, all investors received $6,000 in contribution room for their TFSA and I was ready for both accounts. As I hinted, I have bought TD on sale and it represents 7% of my portfolio for now. I have added money to my non-registered account and Computershare holdings. I started regular contributions to my two Computershare holdings. Telus is monthly and TransCanada Pipeline is quarterly. I can confirm with my data that holding shares through Computershare over a discount broker generates a higher rate of return over time as more fractional shares compounds. I made an opportunistic switch and dropped Cardinal Health and bought more Apple in our RRSP account. I added industry diversification to highlight how companies within a sector can still be very diversified. The Toronto Stock Exchange (TSE) is very heavy in financials and energy and it’s important to learn to diversify within those two sectors. 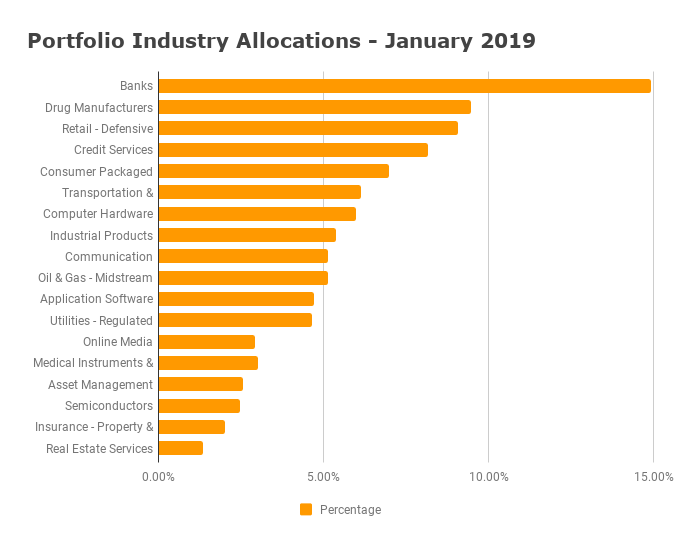 As you can see, I am fairly overweight in the financial sector but once you break it down my industry, you can see it broken down into banks, asset management, credit services and insurance which have very little risk overlap. 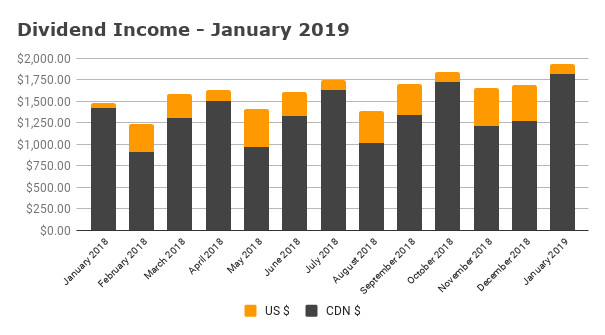 My January 2019 dividend income is $1,939.36. 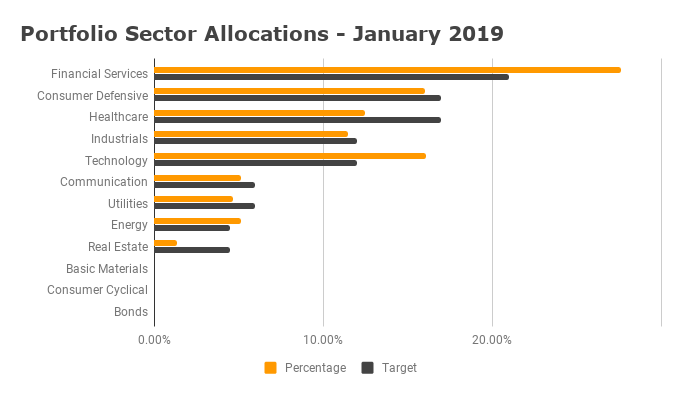 The year is already bringing some dividend increases. You can see below that the January income is up $450 for the month. I do not expect to have many $2,000 month but I should break it. Keep in mind my portfolio is build for growth and not retirement income. My dividend yield is 2.62% but many of my holdings provide a dividend growth at or above 10% annually.